A redesigned BWTAS mug is now available! This time, it not only features the BWTAS logo, but also a unique work of art — the stunning interpretation of a London water tower – 'Ladbroke Lady' by Suffolk artist Clare Johnson. The mugs are available in two sizes: Bone china (8 fl oz) or the larger (10 fl oz) enamel mug. 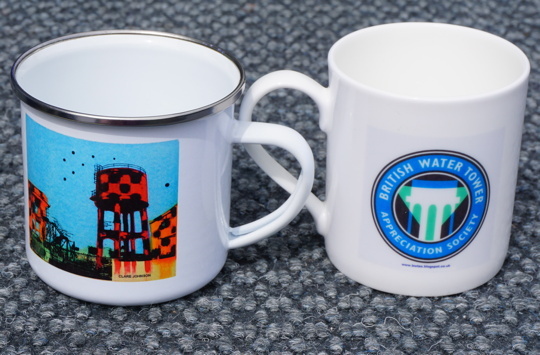 These new mugs are only available direct from BWTAS for only £5·00 + £2·90 p&p (for up to 3 mugs). These are sure to sell quickly, if sales of our original mug are to go by, so get ahead of the game and get your Christmas gifts now. Orders with cheque made out to BWTAS please, to BWTAS, Green Gables, The Street, Wenhaston, Suffolk IP19 9DP.